Summer is a great time of year to enjoy fresh flowers. We’re not all lucky enough to have a garden – and for many of us that garden is a lawn, a shed, a washing line and not much else! Why not bring a little summer garden into your home? 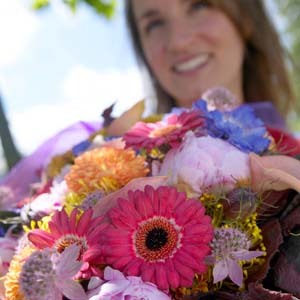 Here’s our shopping list : hot pink gerbera, pale pink peonies, blue scabious, pale pink astrantia and orange dahlias. Great for someone outgoing like you, with a bright sunny personality.